BLOG: New Living Wage Places scheme celebrates councils & ‘anchor institutions’ working collaboratively to tackle low pay. A new scheme from the Living Wage Foundation- Living Wage Places - celebrates the areas where councils and ‘anchor institutions’ are working collaboratively to tackle low pay. Clare Goff, Project Manager of the scheme shares the ambitions of the scheme, and its impact on working people and local economies. The Living Wage Foundation has launched a new scheme to recognise the efforts of places that are paying and promoting the real Living Wage. Making Living Wage Places, supported by Carnegie UK Trust and the Scottish Government, will formally endorse the towns, cities, boroughs and regions that show leadership, progress and ambition on the uptake of the real Living Wage. 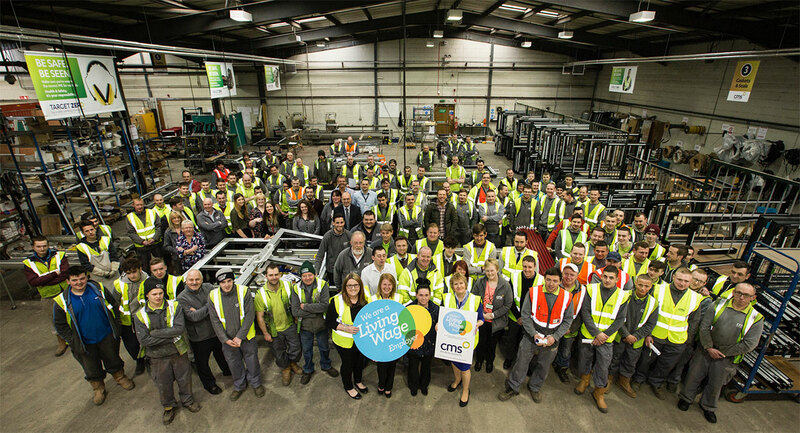 The Living Wage Foundation and Living Wage Scotland are currently working with four cities across England, Scotland and Wales, as well as a town in north east Scotland and a London borough to pilot the Making Living Wage Places scheme. To begin the process of recognition for Making a Living Wage Place, each pilot, led by the local council, is required to form a Living Wage Place Action Group which brings together local ‘anchor institutions’ that are committed to increasing the uptake of the real Living Wage in their area. Anchor institutions are major local employers that are representative of their place due to their long-established social, cultural or economic roots in the area. Hospitals, universities, art galleries, football clubs, transport providers and major private sector employers are encouraged to pay the Living Wage to their direct and contracted staff and to work collaboratively with other local anchors to tackle the broader challenge of low pay in their locality. Despite the growth of the Living Wage movement, our research shows that there remains much to be done to expand uptake of the Living Wage in towns and cities across the UK. Only around a fifth of UK universities and just four Premier League teams are accredited Living Wage employers. The impact of a council or major employer accrediting to the real Living Wage can be significant. Accredited Living Wage employers need to ensure both their direct and contracted staff are paid the real Living Wage, leading to pay rises for many workers. Some councils go further, using their local networks and influence to extend broader uptake of the real Living Wage. In Preston, for example, both the City Council and the County Council now pay the real Living Wage to their staff, and Preston Council has encouraged other local employers to accredit as Living Wage employers; a quarter of low-paid workers in the city and its surrounds have now received a pay increase due to their place of work becoming an accredited Living Wage employer. Local economies also benefit from the increased productivity and extra spending power of local citizens when they are uplifted to the real Living Wage. Recent research by the Smith Institute calculated the ‘Local Living Wage Dividend’ to city regions if a quarter of low-paid citizens within a region are given a pay rise. The report found that Greater Manchester, for example, would get a £53m economic boost and West Midlands would grow by £51m. The real Living Wage is based on the cost of living and now stands at £9 an hour for workers outside London and £10.55 for those based in the capital. In many places, councils and major employers are stepping up to ensure that local citizens are pulled out of the low pay trap and are reaping the benefits within their local economies. Over the next few months these places will be recognised and celebrated as the first Making Living Wage Places pilots.